Lovers & Players, read it! I read a book this week. Did you hear that? I read a book this week! And it wasn't even a toddler/baby book! 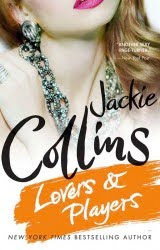 It was an awesome little trashy novel by Jackie Collins, Lovers & Players. I love a good read as much as the next girl and this one has been sitting on my shelf for over 2 years just begging to be read (sad huh?). Problem is I've had NO time to myself, or maybe I've just felt a tad guilty burying myself in a book for a week? Who knows, but I got over it this week and I'm SO glad I did! I could barely put the book down and loved every minute of it. You can read more about it here. If you like a trashy novel full of gossip and drama like me, this book is for you. Take a week off and read it! Maddie is almost 18 months old and I'm 17 weeks pregnant (eek!). Yes, I realize it's been quite some time (like 4 months) since I last posted. I'm a bad blogger but let's just pretend it's not been that long? Many apologies! On the 4th, Maddie & I (hubby was working) went with the in-laws up to our local peach orchard in hopes of picking our own peaches. They had been over-picked the day before so no picking but lucky for us they had plenty to choose from inside. I love that place, it just smells like yummy peaches and I swear you start drooling as you pull into the parking lot. We brought home more peaches than any one human could possibly eat all promising to make yummy treats this week. I started with a tuna salad with white peaches, sounds yummy but the recipe really needs some work so you probably won't be reading about it anytime soon. Then I turned to Paula (Deen), who never lets me down. I can honestly tell you this was the best peach cobbler I've ever had, hands down! It was the perfect combination of peaches and cobbler (not too little like most recipes), I was in HEAVEN! Paula really knows her stuff, which is why I love her! Combine peaches, 1 cup of sugar, and water in a saucepan and mix well. Bring to a boil and simmer for 10 minutes. Remove from heat. Whisk remaining 1 cup of sugar, flour and milk slowly to prevent clumping. Pour mixture over melted butter but do not stir. Spoon fruit on top, gently pouring in syrup. Sprinkle top with cinnamon. Batter will rise to top during baking. Bake for 30-45 minutes. *I used 10 smaller peaches and probably could have used 12 - 14. You can adjust the number of peaches depending on how peachy you like your cobbler. Maddie is almost 18 months old and I'm 16 weeks pregnant with our 2nd baby... crazy!